With our increasingly busy schedules, finding time to go to the gym is becoming a real challenge. It’s no wonder that more and more people choose to workout in the comfort of their home. With the proper equipment you might be able to achieve good results. 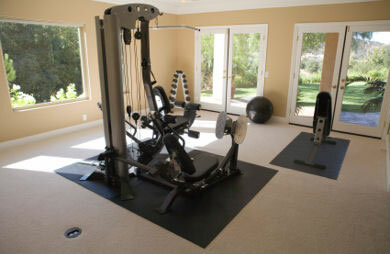 Here is a list of three items you will need before you can start working out at your place. This is your best ally. Most people do not have flooring designed to be worked out on, so having a quality mat can prove to be quite beneficial. However, a yoga mat is not just for comfort, it’s also effective in preventing you from sliding while doing exercises such as lunges. If you are going to work out from your home, you will need to rely on video streaming or workout DVDs. A laptop/tablet comes in very handy in these situations. You might want to consider a good screen size and good audio quality. You want to be able to see and listen to the instructions carefully in order to properly carry out each move. Most sets come in different weight ranges. It’s up to you to choose which one suits you best. The only advice would be to get one that is easy to store away. Another tip would be to get dumbbells that allow you to wrap your fist around them while doing pushups. This will prevent any discomfort arising from doing pushups by placing your hand directly on the floor.